After the hanging of 38 Dakota warriors in Mankato, Minnesota in the aftermath of the U.S.-Dakota War, the other 270 Dakota men who had been sentenced but not hung were sent to a prison camp in Davenport, Iowa. This is where they heard the rumor of President Lincoln's assassination. 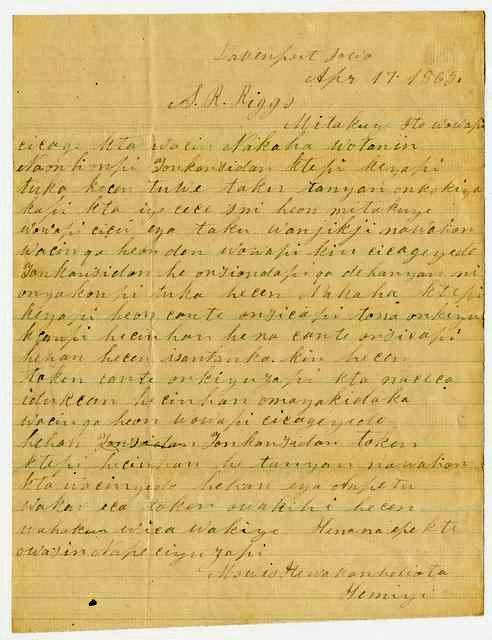 Moses Many Lightning Face, one of the prisoners, sent this letter to missionary Stephen Riggs asking if the rumor was true. It was recently translated from the Dakota by Dr. Clifford Canku/Mato Watakpe and published in the book The Dakota Prisoner of War Letters; the original is in the Collection of the Minnesota Historical Society. Well, my relative, I wish to write you a letter, we have heard news. They have said that the President [Abraham Lincoln] was killed. But someone of authority should tell us if this is not true. Thus, my relative, I write to you this letter. Also, I have heard several rumors, therefore, I want to write you this letter – it is so. The President has compassion for us, as so far we are still alive, but now they told us he was killed, and we are saddened. Those of us here think if this is so, we are heartbroken. Perhaps the attitude of the cavalry soldiers may change toward us. Tell me what your thoughts are, I want to know, that’s why I write to you. Then I wish to hear exactly how they killed the President. Then, also on Sundays when I am able, I do the preaching to them. That is all I’m going to say, I shake all your hands.